"I feel incredibly invigorated and empowered by today's RJ training. I have experienced a lot of trainings in OUSD and this was truly the most thoughtful one in my 11 years as a teacher. Thank you!" In OUSD, Restorative Justice (RJ) is a set of principles and practices inspired by indigenous values used to build community, respond to harm/conflict and provide individual circles of support for students. By building, maintaining and restoring relationships between members of the entire school community, we help to create an environment where all students can thrive. Our program is implemented through a 3-tier, school-wide model. Tier 1 is characterized by the use of social emotional skills and practice (classroom circles) to build relationships, create shared values and guidelines, and promote restorative conversations following behavioral disruption. The goal is to build a caring, intentional, and equitable community with conditions conducive to learning. Tier 2 is characterized by the use of non-punitive response to harm/conflict such as harm circles, mediation, or family-group conferencing to respond to disciplinary issues in a restorative manner. This process addresses the root causes of the harm, supports accountability for the offender, and promotes healing for the victim(s), the offender, and the school community. 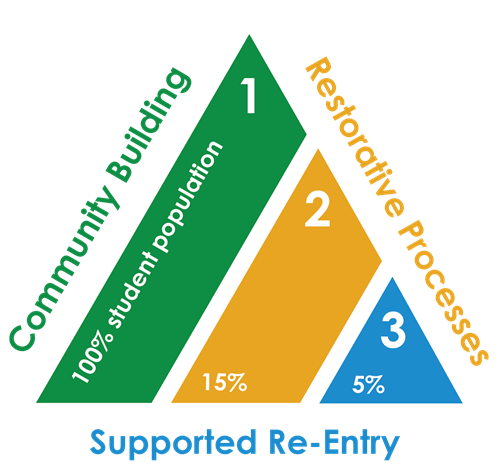 Tier 3 is characterized by 1:1 support and successful re-entry of youth following suspension, truancy, expulsion or incarceration. The goal is to welcome youth to the school community in a manner that provides wraparound support and promotes student accountability and achievement.